The Vector Network Analyzer, VNA2180, measures impedance (magnitude and phase) and filter transmission in the range of 5 KHz to 180 MHz. A PC is used to plot parameters, such as: Impedance, SWR, Return Loss and S21. Port A is equivalent to an antenna analyzer. (Similar to the AIM4170C). Port B has a 50 ohm input impedance with return loss greater than 30dB. 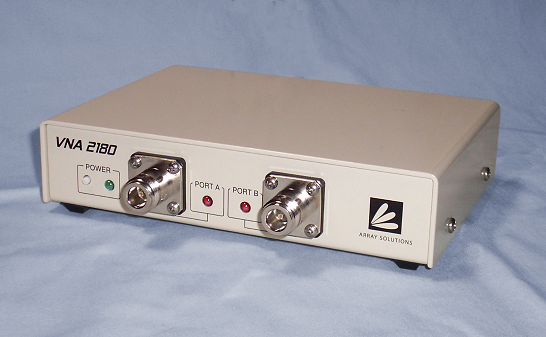 Port B nominal dynamic range: 100dB up to 50MHz, 80dB up to 160MHz. Programmable RF amplitude for Port A (+7 to -13 dBm). Digitized data is sent to the PC via an optically isolated USB port. Power for the VNA can be obtained from a small DC power supply or a battery. With a laptop computer, the unit is quite small and portable. Measurements can be made at ground level and translated as if they were at the antenna feedpoint by using the refer to antenna function. The impedance at the antenna itself can be read with the VNA located in the shack at the receiving/transmitting end of the coax. The cable can be any length. The cable's impedance and loss characteristics are determined by a simple calibration procedure and the antenna's impedance is then plotted directly during the scan. 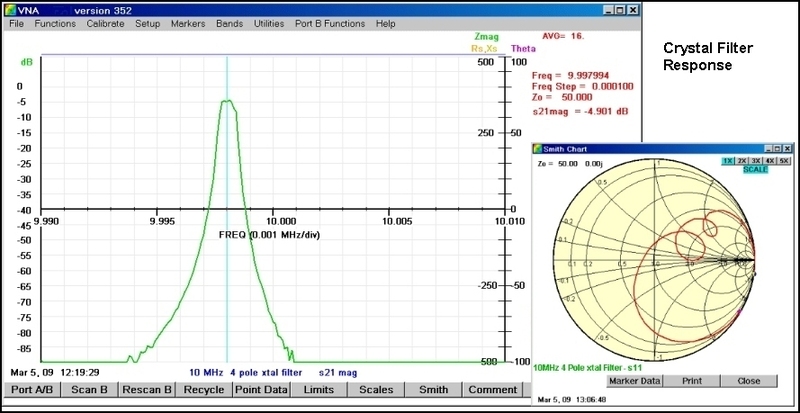 10.7 MHz Bandpass filter showing VNA scan overlaid on a scan using Rohde & Schwarz FSH3. The VNA2180 is not a replacement for the AIM4170. The AIM4170C will continue in production. The VNA2180 is available for $995 including standard calibration loads, cables and power supply for 120V operation.